1. Mix together, in a small bowl, ricotta, lemon zest, 1/8 teaspoon salt; season with pepper. Set aside to come to room temperature. 2. Melt 1 tablespoon of the butter in a large frying pan, over medium heat. Add prosciutto in a single layer and cook, flipping occasionally, until crisp & golden, about 5 minutes. Remove and drain on a paper towel. Save the drippings in the pan. 3. Melt the remaining butter in a small saucepan over medium heat. Add the peas & water, season with salt & pepper; simmer and stir occasionally, cook till tender 3 (frozen) to 5 minutes (if fresh); or to taste. 4. Remove from heat and “smash” with a potato masher or the back of a jar; breaking the peas up (they will absorb the excess liquid). Stir in the mint & lemon juice. Taste & season with salt if needed. 5. Place frying pan back on medium heat; add bread slices and toast on both sides until golden-brown; 1-2 minutes. 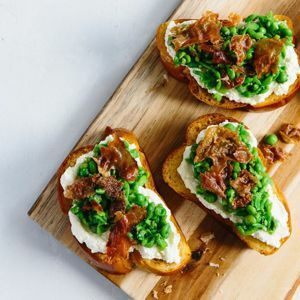 Using your hands break up the crispy prosciutto and sprinkle over the pea mixture. Serve immediately.